Intel's modem quality is improving rapidly, and it benefits us all to have one global hardware variant. That’s the quote from Qualcomm CFO George Davis, made during its earnings call with analysts on June 25, that sparked a small firestorm among Apple pundits. When he says “our competitor” he’s talking about Intel, whose modems are already used in many iPhones. It’s no wonder Apple is trying to break from using Qualcomm’s products, as the two companies are still caught up in an epic years-long series of lawsuits against each other. The opinion pieces quickly followed, warning that this year’s iPhones would have slower cellular connections than top-tier Android phones, and that the lack of a Qualcomm modem would set the iPhone back. I don’t think that’s necessarily the case. Ignoring the fact that iPhones already have slower cellular connections than the best Android phones, and have for at least a couple years now, these opinions appear to be based on the assumption that Qualcomm’s modem would again hold a major advantage over Intel’s. I don’t believe that is necessarily true. In broad strokes, you can think of it like this: Apple uses a Qualcomm X16 modem for carriers and markets where it has to have CDMA network support, and an Intel XMM 7480 for carriers and markets that are GSM-only (which is most of the world). These modems differ in more than just CDMA support, though. The Qualcomm X16 is clearly superior. It supports 4x4 MIMO antennas, 4-way carrier aggregation, and LAA (Licensed Assisted Access). Add these together and you get theoretical “gigabit” speeds. But the Intel modem doesn’t support 4x4 MIMO antennas nor LAA, so Apple disables those features in the Qualcomm-equipped iPhones. Presumably, they don’t want one identical-looking iPhone to have remarkably better cellular speeds than its twin. PCMag’s testing shows that, even somewhat hamstrung, the iPhones with a Qualcomm modem are fater than those with Intel inside. Still, the X16-equipped iPhones are better. Not only do they give you the option to take your phone to Verizon or Sprint if you want to switch carriers, but PCMag’s testing has confirmed that they perform a little better, especially when the cellular signal is weak. 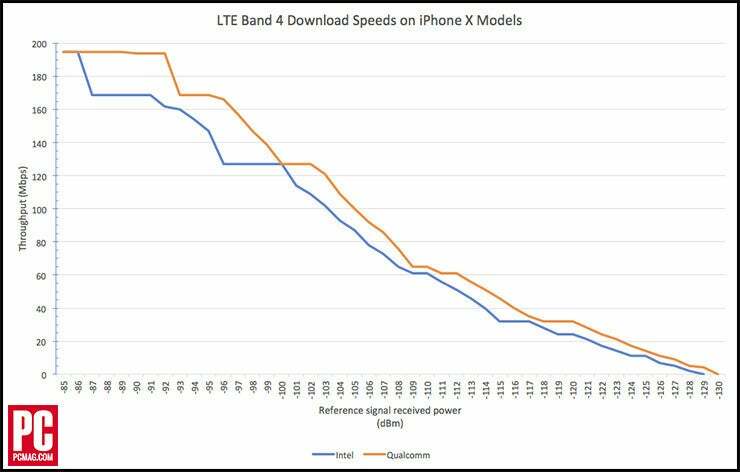 It’s tempting to look at the current two-modem situation and assume that Apple dropping Qualcomm means getting rid of the “good” iPhone and keeping the “bad” iPhone. Maybe that’s not the case this time around. The X16 has a big set of advantages over the XMM 7480: 4x4 MIMO, LAA support, CDMA and more LTE bands supported, and it’s built on a 14nm manufacturing process. Intel’s 7480 supports fewer bands and modes, and is manufactured using a much less efficient 28nm process. For this year’s phones, Apple has surely been considering the successor to these two modems: the Qualcomm X20 and Intel XMM 7560. We don’t know how they compare in the real world, but on paper, the playing field is pretty level. Intel has finally moved up to its 14nm manufacturing process with the XMM 7560, and while the X20 is made using a 10nm process, you can’t necessarily consider it superior (different manufacturers measure chip process technology with different standards: Intel’s 14nm is roughly equivalent to Samsung’s 10nm). The jump from 28nm to 14nm should help make Intel’s modem far more energy-efficient. Both modems supports five-way carrier aggregation, LAA, 4x4 MIMO, and the same major carrier modes: LTE-FDD, LTE-TDD, TD-SCDMA, GSM/EDGE, UMTS/WCDMA, and CDMA/EVDO. They both claim over 1Gbps downlink speeds and 150Mbps uplink speeds with 256QAM (downlink) and 64QAM (uplink). Running down the specs list for the X20 and the XMM 7560 finds that they are much more similar than the Intel and Qualcomm modems in iPhones today. 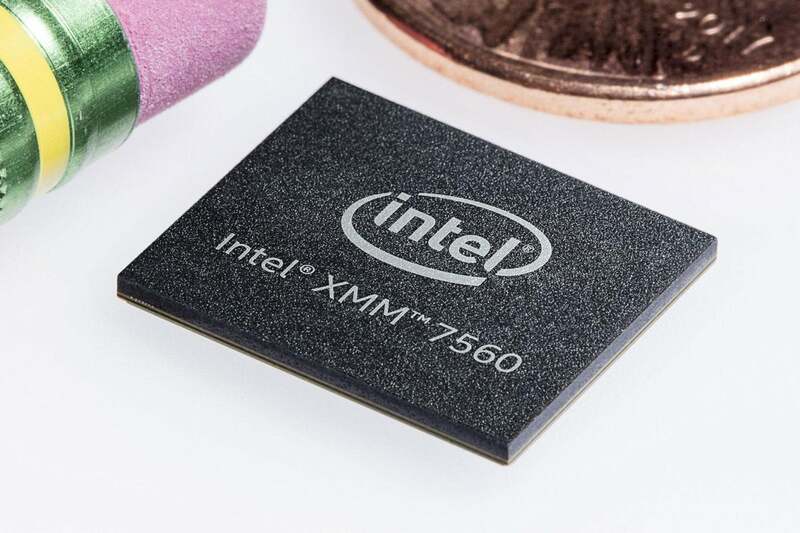 Of course, implementation details make a big difference, and specs don’t always indicate real-world performance, but on paper you’re not losing much at all going with an Intel XMM 7560 instead of a Qualcomm X20. If the Intel modem Apple is likely to use is just as good as the Qualcomm modem they would use, then does is really matter which of the two ends up in this year’s iPhones? And if Apple uses two modems but hamstrings the better one to equalize performance (as it does today), does it matter which one they choose? The real benefit to Apple dumping one of its two modem vendors is the creation of a single worldwide iPhone variant. If the Intel XMM 7560 covers enough carrier modes and LTE bands to work well in every market and for every carrier the iPhone supports, we may finally have what we’ve wanted for years: a single worldwide iPhone. That’s a big win for customers. You would no longer have to worry that the iPhone you bought from your carrier can’t be unlocked and brought to this one specific other carrier. You wouldn’t have to worry about your trip overseas and whether your phone will work with the networks there. Most iPhone buyers only think about which iPhone model they’re buying (e.g. iPhone 8 Plus vs. iPhone X) and maybe how much storage space they should spring for, completely unaware that there are different variants with different carrier compatibility. Moving to a single worldwide modem will eliminate nasty surprises.